When you speak to Ruth Mackenzie it’s her zealousness about the role of artistic director she is about to step in to that you first notice. “The Holland Festival has a tradition of innovation,” she enthuses. 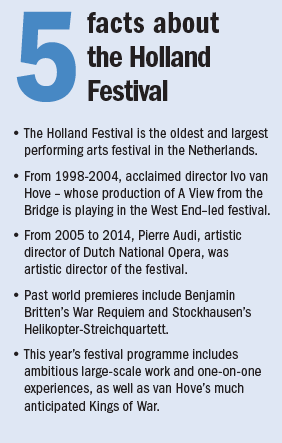 Founded in 1947, the Holland Festival is the oldest and also the largest arts festival in the Netherlands. It takes place in Amsterdam and encompasses theatre, opera and music. From 2005 until last year, the festival was curated by Pierre Audi, with the 67th Holland Festival – the 10th edition under his artistic leadership. Mackenzie, formerly the director of the London 2012 Festival, for which she was awarded a CBE, has a dauntingly impressive CV, which includes stints at the Manchester International Festival and Scottish Opera. 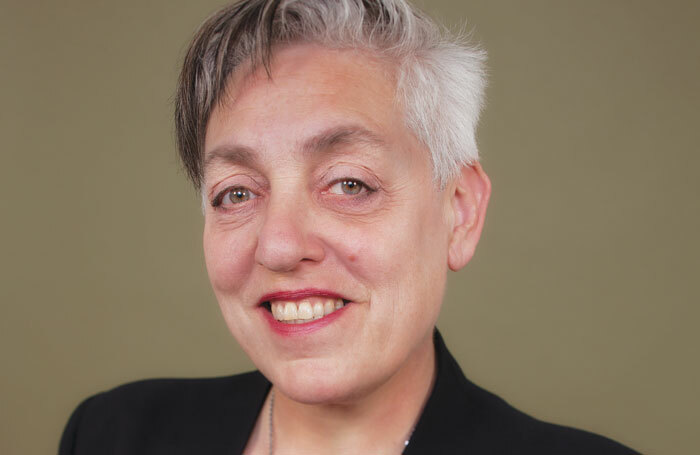 She was artistic director of Chichester Festival Theatre from 2002 to 2006, and worked as a special adviser to the Department for Culture, Media and Sport from 1999-2002. When speaking to her for the first time it is her fierce passion for arts, and their power to inspire and transport, that comes across the most. “In his last festival, in 2014, his programming broke box office records for the festival. I’ve known Pierre since his days at the Almeida – I would say he has shaped my tastes, introducing me to a new generation of artists from Europe that had never come to the UK. That was incredibly influential for me. I’m a great fan of his and he remains a partner to the Holland Festival,” she says. This year, Audi’s Dutch National Opera is presenting William Kentridge’s production of Lulu, one of several high-profile shows in her inaugural programme, which also includes one of the most hotly anticipated productions in international theatre, van Hove’s Kings of War for Toneelgroep Amsterdam, a potent combination of Shakespeare’s Henry V, Henry VI and Richard III in the vein of his earlier success, the Roman Tragedies. 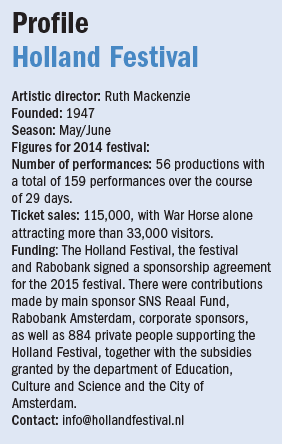 Mackenzie has marshalled the London 2012 Festival, but the Holland Festival presents her with a different proposition. There will also be work popping up, she says, in some of the city’s main squares. One of Mackenzie’s other roles was as interim launch director at The Space, the platform for digital arts created jointly by Arts Council England and the BBC. Productions playing with digital expression include Catalan company La Fura dels Bau’s Murs, a ‘smart show’ in which audiences can participate by using an app on their phone. With Kentridge’s Lulu, one of the most high-profile productions in her first programme, Mackenzie – who is “always looking for brilliant talents, both women and men”, said she was keen to make sure that the programme included some kind of dialogue with Lulu. While there are many works that fit the criteria, one of the pieces that seems to do this most overtly is Christiane Jatahy’s What If They Went to Moscow?, a Brazilian take on Chekhov which uses film to draw the audience into the three sisters’ world, granting them power and agency in the process. Mackenzie is enthusiastic about importing the prom model to Amsterdam for the 12-hour prom – a one-day mini festival inspired by the UK Proms. It takes the shape of an evolving concert, which shifts in tone over the day, and covers “a full range of the history of music, starting at lunchtime and continuing to the early hours of the morning”, with performances including Anna Calvi and the Metropole Orkest. Mackenzie stresses that a festival is about balance and variety. One of the pieces she seems most excited about is Todo lo que esta a mi lado (Everything by my side) by the Argentine theatre-maker Fernando Rubio. It is a one-to-one experience that will take place in squares around Amsterdam – a performance that has the capacity to be intensely personal but also puts participants on display. “You get 10 minutes in bed with an actress and it’s a very intimate and special performance,” she says. “At the same time, there will be a few hundred people taking photos. So you’re the only member of the audience and the star of the show.